Self-confidence is the key to success both socially and in the workplace. If your self-confidence is diminished by some aspect of your physical appearance, perhaps cosmetic plastic surgery is your answer.A beautiful woman with her hair pulled back.The first step is to find a cosmetic plastic surgeon who is board certified by the American Board of Plastic Surgery and has extensive experience in the most advanced procedures of cosmetic plastic surgery. At our cosmetic plastic surgery center, we design an individualized program to meet your needs. Our goal is to thoroughly educate our patients about the potential rewards and limitations of plastic surgery, so they can make an informed decision. Anyone considering cosmetic plastic surgery should be aware of the difference between a highly skilled board-certified cosmetic plastic surgeon with extensive training and a so-called “expert” whose training consisted of a weekend course.With advancing age, come numerous options for the care and repair of facial skin. Teaming with an expert aesthetician, we encourage the use of the finest skin care products and rejuvenation techniques. However, surgical intervention is advised, sooner rather than later, while skin resiliency is optimal, to derive long-lasting results.Choices range from endoscopic procedures with minimal incisions and recovery times, to more sophisticated facelifts, which redefine lost facial contours. While younger patients are usually not ready for full facelifts, their features can be beautifully enhanced by corrective eyelid surgery, brow lifts, rhinoplasty, and/or neck lifts. Laser rejuvenation is a modality for skin resurfacing that may be appropriate for patients in this age group. Quick procedures, such as BOTOX® to smooth out wrinkles and frown lines, and the latest techniques for lip augmentation, entail minimal downtime and can help you look your best. Soft tissue fillers like JUVÉDERM® or your own fat may also be a solution.New computer imaging technology permits patients to visualize and appreciate the anticipated results of isolated and combined facial cosmetic surgery procedures. 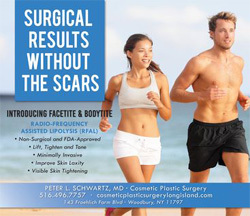 It is important that patients have realistic expectations before choosing any cosmetic procedure.Cosmetic Plastic Surgeon Office Woodbury, Long IslandBody contouring, via liposuction, is a commonly requested surgical procedure. The tumescent technique can surgically remove fat deposits from the abdomen, thighs, buttocks, and legs. Frequently combined with ultrasonic manipulation, areas previously resistant to exercise and diet can be sculpted to smooth contours. Most patients can resume their work activities after a few days.Liposuction, however, is not the answer for everyone. Patients with redundant skin and/or lax musculature may require a more extensive surgical procedure, the tummy tuck (abdominoplasty), to achieve the desired results.Whether redefining the shape of a nose, sculpting new body contours, revitalizing droopy eyelids, or reshaping breasts, the goal is to create a completely natural look. Classic beauty should be understated, never obvious.So give yourself the gift of self-confidence today, and open up new doors for success tomorrow. Patient Confidentiality Statement: I respect the privacy of my patients and do not show patient photographs on the Web. However, before and after photos may be seen in the privacy of my office. Only photographs of patients who have agreed to have their pictures shown will be available.